The Kruger-Rumpf winery was founded in 1790 and nearly 200 years later Stefan Rumpf took over the estate in 1984. Stefan Rumpf began producing his own, estate wines rather than selling the juice off in bulk, as had been customary. Now, son Georg has joined Stefan, after graduating from Geisenheim's esteemed winemaking school. Münster lies in a narrow valley between the Nahe and the Rheinhessen where the Nahe river meets the Rhein. Two Grosses Gewächs sites are the jewels of the estate: the slate vineyard Münsterer Pittersberg and the Münsterer Dautenpflänzer, a tiny parcel within Kapellenberg containing quartzite and loess-clay soils. The 2 hectare Dautenpflänzer is rarely affected by frost and the top layer of soil is rather nutrient rich, both factors important in cultivating young vines. Other important vineyard sites include the Münsterer Rheinberg, made mostly of quartzite with sandy loam, and Binger Scharlachberg, composed of porphyr and red sandstone soils – a site that actually lies across the mighty Nahe in Rheinhessen. Vineyards are farmed sustainably at Kruger-Rumpf, and care is taken during the hand harvesting to ensure that only optimally ripe grapes are picked, as Georg does not favor any botrytis. Stefan believes "You can't improve wine in the cellar, only make it worse." 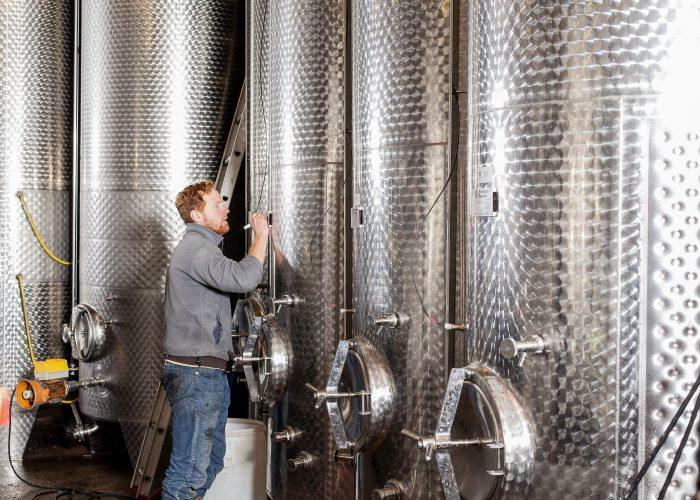 A short fermentation is preferred, as the Rumpfs believe a long fermentation will remove fruit and freshness of character in the wines. Fermentations occur spontaneously with natural yeast for the fruity wines, and though ambient yeast strains inhabitat the 10+ year old stuck used for the Grosses Gewächs, sometimes a neutral strain of cultured yeast is required to complete its fermentation. Often the wines stay on their gross lees well into spring. The wines produced show the best of his renowned vineyard sites, with haunting brilliance, concentration and extract.